Lionel Messi continues to lead the goal-scoring charts across Europe’s top five leagues. The prolific Argentine scored twice in Barcelona’s 2-2 La Liga win at home to Valencia on Saturday, taking his tally to 21 goals in 20 appearances. Young French prodigy Kylian Mbappe is hot on his heels though, bagging 18 goals in 16 Ligue 1 appearances despite failing to find the target as Paris Saint-Germain suffered their first league defeat this season, losing 2-1 away to Lyon. He still boasts the best goals per game ratio among the top five scorers though. Team-mate Edinson Cavani also fired blanks during the encounter over the weekend and with 16 goals from 15 games, he drops down to fourth in the list with Cristiano Ronaldo overtaking him. The Juventus star scored a brace at home to Parma but still saw his side draw 3-3 after a late comeback from the away team. Sampdoria forward Fabio Quagliarella had equalled Gabriel Batistuta’s record of netting in 11 consecutive Serie A games but could not better that feat as his side were beaten 3-0 at Napoli. The 35-year-old has 16 goals after 21 appearances. Real Madrid are on fire and the man – well, boy – that has provided the spark is Vinicius Junior. 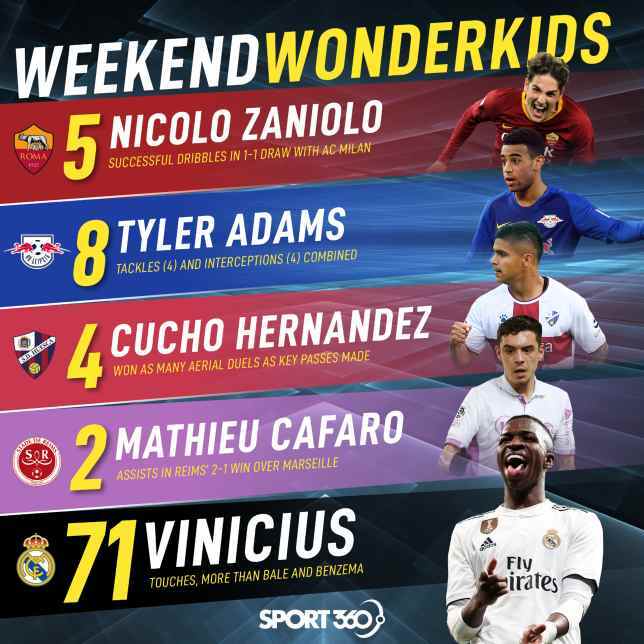 The Brazilian takes pride and place in this edition of Weekend Wonderkids after a performance in victory over Alaves that surely now puts him on a pedestal alongside established stars Karim Benzema and Gareth Bale in attack. Without further ado, here’s our five picks from this weekend’s action. Move over Bale and Benzema. 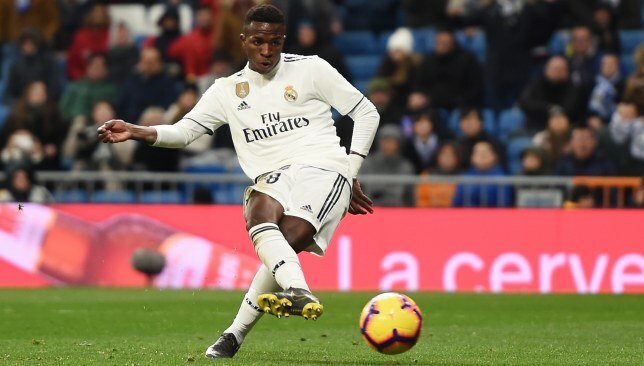 Vinicius is blossoming from exciting curiosity into perhaps the most crucial member of Real’s attack – and he doesn’t even turn 19 until July. 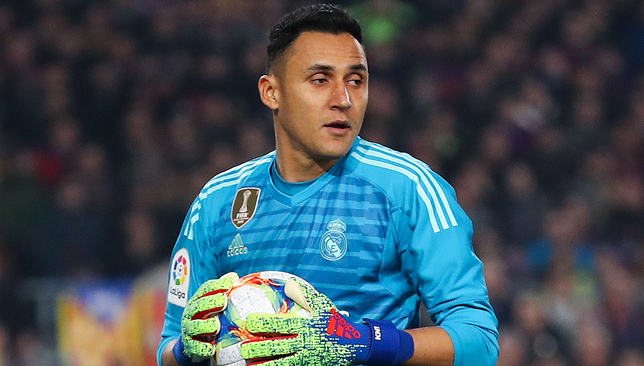 His last four starts have resulted in four wins for Los Blancos and the Sunday performance against Alaves was his most refined yet. The Brazilian is beginning to show rare discipline for a player so young. It is notable how he is so willing to hug the touchline and create width that has been so sorely lacking at the Bernabeu. That tendency revealed itself for Real’s first goal, as his perfectly weighted pass – nutmegging a defender in the process – set Sergio Reguilon surging to release Benzema for the tap-in. He then made the result safe with 10 minutes to go, this time finishing the move he started. At full gallop he found Marco Asensio with a cross-field ball on his left foot, and received it back in the area before scoring with his right. Oh, how Inter Milan are regretting letting this boy go. Featuring for the second time in the past three editions, this weekend the 19-year-old became the youngest player to score three senior goals for Roma since a fresh-faced Francesco Totti in 1995. It truly is difficult to identify an area of weakness in his game. At an intimidating San Siro against an AC Milan side buoyed by the signing of Krzysztof Piatek, Zaniolo was the best player on the pitch. In a cagey game, Zaniolo was often the only man forcing the issue, as he habitually makes intelligent little forays into the final third but refuses to give up possession when taking a risk. Much of that is down to his unbelievable agility at 6ft 3in tall, a warrior with a ballerina’s feet. His goal that tied the game at 1-1 early in the second half was opportunistic, and he faded slightly from there on in. However, there’s no doubt he’ll either score a lot more goals for Roma – or earn them a lot more money in transfer fees. There is a little Luis Suarez on Juan Camilo ‘Cucho’ Hernandez, the Colombian scrapper who is fighting tooth and nail to help Huesca avoid the drop from La Liga this season. At just 18 last year, Hernandez, on loan from Watford, fired the Spanish minnows into the first division for the first time in their history. His efforts in the 4-0 pummelling of Real Valladolid have revived their slim hopes of survival. Hernandez is a touch over 5ft 7in but won four aerial duels against Valladolid, the first disrupting the high line that saw Enric Gallego race through and score. It was through sheer force of will that he created Huesca’s third, harassing uncertain defenders before the ball ricocheted to Moi Gomez who did the rest. Whether he quite has the physique to flourish in the Premier League with Watford is up for debate, but La Liga clubs may have seen enough to stop him from leaving their division come what may in the summer. Want a measure of Adams’ impact for Leipzig thus far? His side have won his only two Bundesliga games by an aggregate of 7-0. The second of those was Friday’s 3-0 drubbing of Hannover away from home, playing the role of midfield anchor in supreme fashion for a mere 19-year-old. The USA international broke up play numerous times, tallying four tackles and interceptions each, while his passing accuracy ticked over at a healthy 85 per cent. Adams is a mobile player and popped up in wide areas at times without recklessly moving out of position. 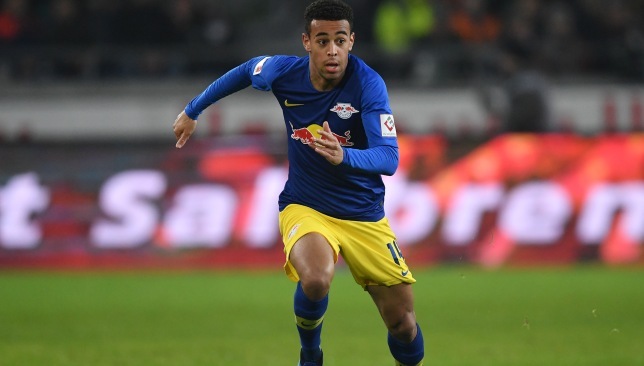 It is quite clear that he has spent time as a full-back and winger already in his career, having moved from New York Red Bulls over the summer. Watch his development closely. European coaches often lament the dearth of central midfielders and Adams could well be a flagbearer for the next generation. Cafaro is playing the role of a reformed bad boy with newly promoted Reims. Having bizarrely been released by boyhood club Toulouse for shooting an airgun at a member of the public, Cafaro has quietly set about restoring his reputation in the north of France for the past two seasons. A winger who primarily plays on the left, the 21-year-old is still a touch too careless with the ball to be considered a top-tier talent – especially in France. However, he has delightfully quick feet and his end product is becoming more consistent to match. He squeezed past two defenders to supply Tristan Dingome with the opener against Marseille, then an instinctive through ball to Suk Hyun-jun ultimately sealed a 2-1 win that moves surprise package Reims further into European contention in Ligue 1. Neither does Cafaro lack for work ethic – he averages two successful tackles per game despite being stationed out wide. He could soon be worth a look by a bigger French club if he remains on the straight and narrow.